NEXT MEETING: THE EBS HOSTS BOB KNAUFF & OLD FORESTER! 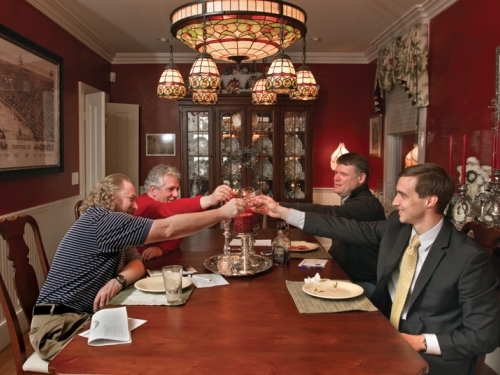 The Evansville Bourbon Society (EBS) was established by Michael Erwin (pictured above, back right) in 2013. Fresh off a trip to all 7 (at the time, now 9) distilleries on the Kentucky Bourbon Trail, Michael knew he had to share his experience and passion for bourbon with his fellow Evansvillians. So, he created the club. It started out as a Facebook group and eventually, as popularity skyrocketed, needed a formal structure. After consulting with local officials he formed EBS as a private club. In order to join one has to be invited by another member. It began with 26 members and has quickly grown to over 100 members. EBS has meetings every other month during which distillers and brand ambassadors lead tastings. EBS has hosted Wild Turkey, Four Roses, Maker’s Mark, Prichard’s, and many more. EBS also does private barrel selections. The most recent selection was a barrel of Knob Creek 120. In Spring 2017 the club will pick a barrel of Old Forester. Every November the group hosts a members-only dinner at location TBD. This years event will be on Thursday, November 10th at 7pm at Acropolis. The theme will be centered around the clubs recent barrel purchase with the dinner consisting of Knob Creek entrées. EBS financially supports It Takes A Village, a local non-profit starting. The club will conduct split-the-pots and auctions to support the organization. It will also donate part of the proceeds from all barrel selections to the organization. If you would like more information on EBS, would like to join the club, or would like to present at a future club meeting, please contact me at tippleandtext@gmail.com. Cheers!